You're running late. You've got soccer-ballet-flute-choral practice and you don't have much time to put anything resembling dinner together. 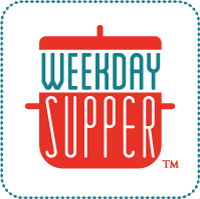 Well, I've got you covered with this easy, super simple #WeekdaySupper meal idea. 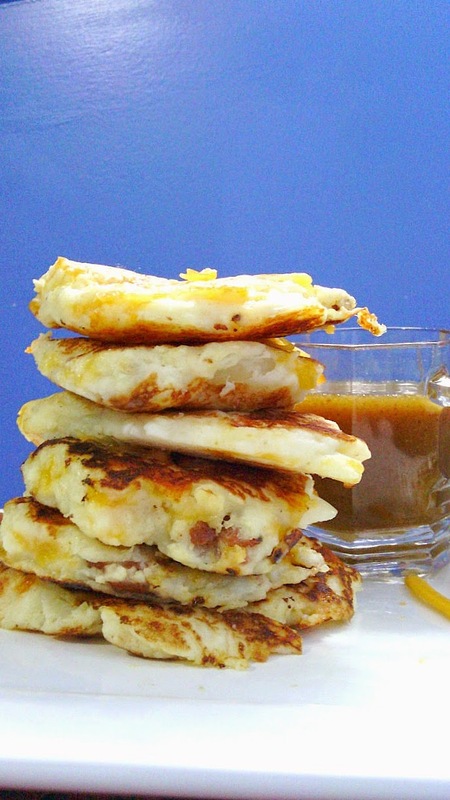 Turn breakfast into dinner with these potato pancakes! Pair with some chicken nuggets and frozen broccoli florets and you've got a meal that will please the pickiest critic at your house! Mix the mashed potatoes, flour, sugar, baking powder, salt, milk, butter and egg together in a bowl; stir in the onions, crumbled bacon and cheddar cheese. Heat a large pan or skillet to medium heat and spray it with non-stick spray. Scoop 1/4 cup batter per pancake onto the griddle. Cook each pancake until you start to see the bubbles forming on top then flip it over and cook for an additional 1-2 minutes on the other side (or until the outside is golden brown). Repeat for each pancake until the batter is gone. Stir together mustard and syrup until well-combined. NOTE: Use instant potatoes and pre-cooked bacon to make the pancakes come together faster. For additional flavor, cook your own bacon and then cook the pancakes in the bacon grease. Love this quick recipe for getting dinner on the table in a flash!! Dijon & maple are meant to be together! Yum! Love your quick breakfast for dinner recipe! I adore making patties with leftover mashed potatoes. The maple syrup and Dijon addition put these over the top! 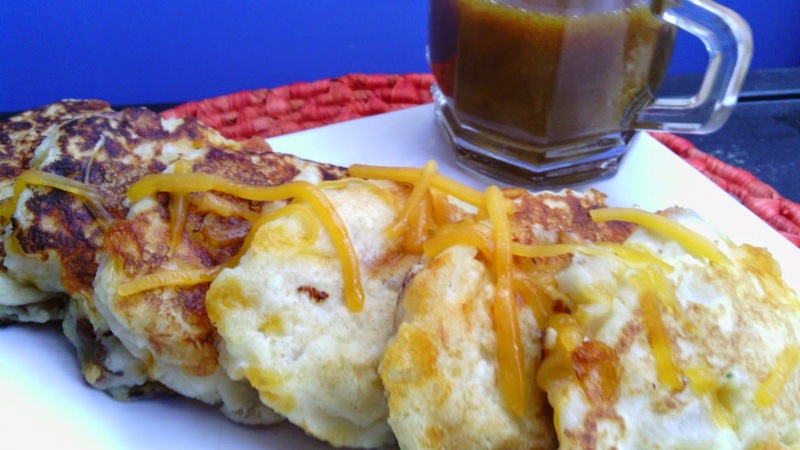 I've never made savory pancakes before, but these look amazing! Such a fun Weekday Supper! My girls (and hubby) would love this! There would be no complaints if I served this up for dinner! What a wonderful, quick meal!!! Oh my my my! That is one awesome supper!! I love having breakfast-y type foods for dinner! This looks fantastic! I *always* make extra mashed potatoes to make potato pancakes the next day. I'm intrigued by your dijon maple sauce. I'll definitely be trying that next time. These little potato pancakes look lovely! Ohmygoodness, Nikki, just reading the name of this recipe made my mouth water! I just used up some leftover mashed potatoes -- shoot! My kind of savory pancake!